These high performance compressors are designed to handle heavy duty mobile air applications with an impressive 150 PSI working pressure. 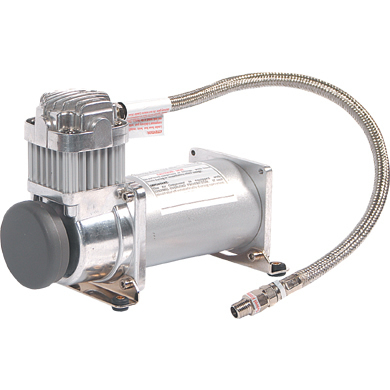 Sealed for moisture and dust resistance, they are also equipped with an automatic thermal overload protector, a factory installed 1-1/2 FT. braided stainless steel leader hose, 2 FT. lead wires pre-fitted with insulated terminal connector and ring terminal, vibration isolating rubber bushings, and all mounting hardware. The 400C has a 33% duty cycle rating, while the 450C is a continuous, 100% duty cycle compressor.